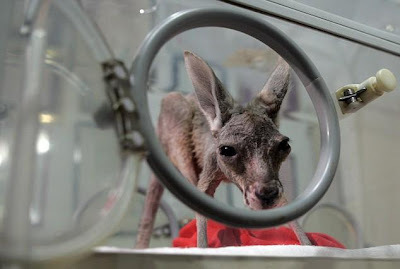 With her huge furrry ears and long, quivering nose, baby kangaroo Tijana is utterly adorable. But her unarguable cuteness hides a rather unfortunate start to her short life. At just a few weeks old, the tiny creature tumbled from the pouch of her mother, who had been terrified by an emu. 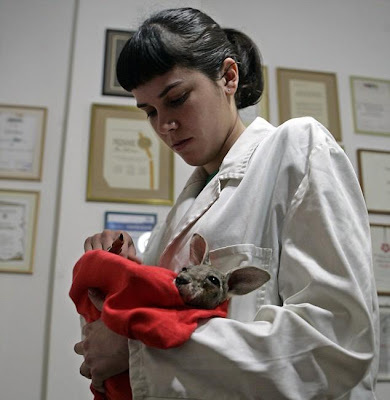 Tijana, who lives at Belgrade Zoo, in Serbia, had to be retrieved by staff and is now being handreared. 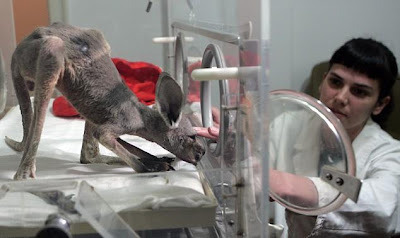 She is still so young she cannot survive outside of a pouch and must stay in a special incubator, where the temperature remains a constant 35C. Biologists have also made a special set of canvas pouches so she can be carried around by staff. Tijana has to be fed every two hours with a special milk that arrived from America and Germany. The Australian embassy is also sending some supplies. 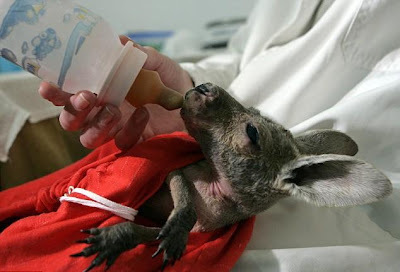 Young kangaroos, known as joeys, crawl into the pouch as soon as they are born. They spend approximately 190 days curled up in the warm and make their first forays out into the world at the end of that time. At around 235 days, the joey leaves the pouch for good but will spend another few months with its mother before becoming independent. Previous post melihat Jenis Jenis Cacing euy !! Cannibal Mother : Ketika Ibu Memakan Anak nya !!! Atraksi Burung UNIK dan KEREN !! !